Brome grasses (Bromus spp.) 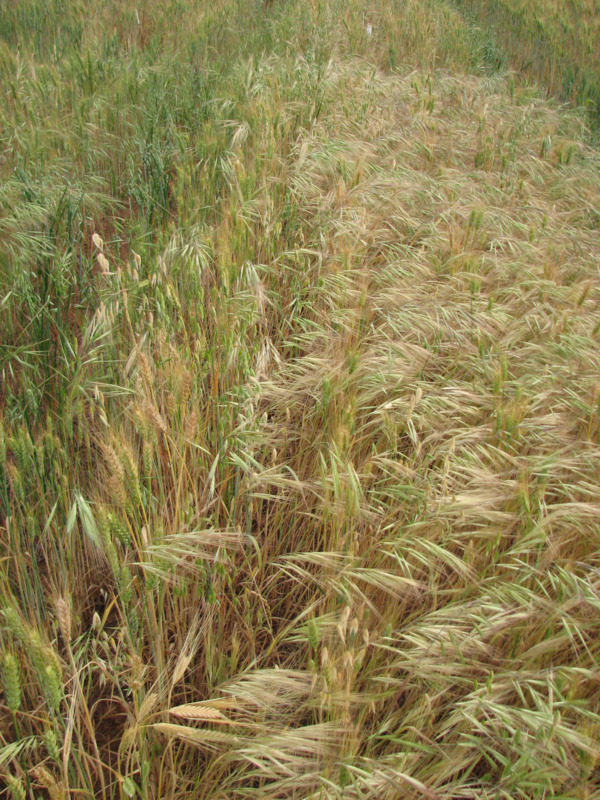 are highly competitive weeds, most problematic in wheat crops. Recent changes in crop production systems, rise in conservation tillage, a lack of availabe selective herbicides and a decline in system diversity have seen an increase in the importance of this weed in Western Australia. Seed is the main source of brome grass infestation and as few seeds remain dormant, the most important aspect of management is to reduce its seed bank. While this page focuses on great brome, the control measures discussed below can be applied to all eight species of brome grass in WA. Great brome (Bromus diandrus var. diandrus and B. diandrus var. rigidus, previously known as B. rigidus) is a widespread grass weed (Poaceae family) throughout the wheatbelt and coastal areas of Western Australia. This species is common to agricultural fields, disturbed areas and native vegetation. There are seven other (less common) species of brome grass in WA, including B. alopecuros (twisted awn), B. catharticus (prairie grass), B. hordeaceus (soft brome), B. japonicas (Japanese brome), B. arenarius (sand brome), B. madritensis (Madrid brome) and B. rubens (red brome). Weed species within the Bromus genus are collectively known as brome grass. Other common names of brome grass are ripgut grass, spear grass, giant brome, jabbers and Kingston grass. Note that while this page focuses on great brome, the control measures discussed below can be applied to all species of brome grass in WA. This annual grass weed occurs in areas with >250mm rainfall and a mean July temperature <15°C. It is more common in cropping rather than pasture fields. Brome grass prefers sandy and loamy soils and can tolerate acidic or alkaline conditions. This weed is more common to paddocks that are frequently planted to cereal crops. Great brome populations can produce 600-3000 seeds per square metre (seeds/m2) (average 1000 seeds/m2). These seeds will have an initial after-ripening dormancy, which is released during the summer period. However, by the start of the following autumn/winter growing season, 85-90% of the seed will germinate in response to adequate rainfall. The highest rate of germination of great brome occurs if seeds are buried within 50-100mm while germination is <1% if buried at or below 150mm. Therefore, in the minimum tillage system, where seeds are generally close to the soil surface, most surviving seeds will germinate in the year after seed production. Those seeds that do not germinate will lose viability after 6-24 months in soil. A small proportion of the soil seed bank may remain viable for up to three years. The persistence of this weed is due to annual seed replenishment rather than the carryover of seed in the soil from year to year. So, seed set prevention in a single year will dramatically reduce the population. Rigid brome grass is more common to the northern wheatbelt, as it can complete its life cycle in the shorter growing season. Some populations may emerge later in the season, allowing them to avoid herbicides at the beginning of the growing season. Further, these plants shed a larger proportion of their seed before crop harvest, making it difficult to remove/destroy seeds at harvest or kill through windrow burning. Why is brome grass a weed? Why is brome grass persistent?